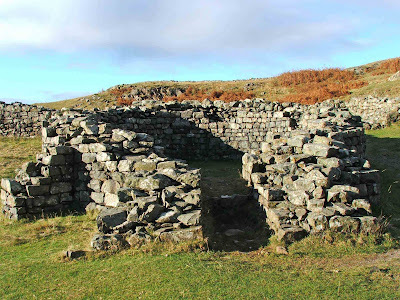 There are a number of well preserved roman forts in Cumbria, ranging from Mediobogdum at the summit of Hardknott pass, Galava at Ambleside and Low Borrowbridge near Tebay.The Romans were here from AD 43 until they left in the 5th century. During their occupation they left behind the remains of fortresses, towns, defensive structures and helped shape the landscape of Britain from the North to the South, and from the West to the East. 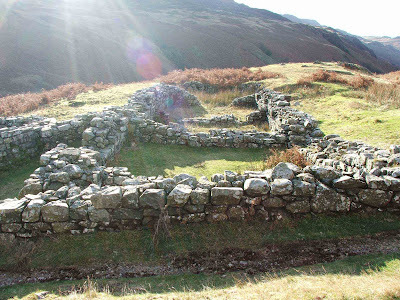 The Romans left their mark on Cumbria as well!! 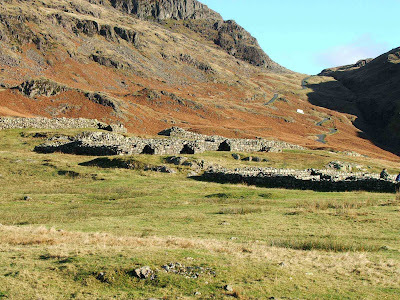 The fort at the summit of Hardknott pass lays 100 yards off the road that runs over the pass down to Eskdale. Above. The fort as seen from the summit of Hardknott Pass. 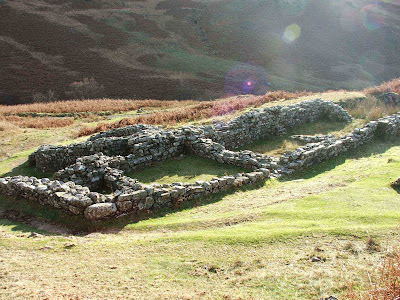 It represents one of the more isolated Roman outposts in the UK. The fort was built between AD120 and AD 138, and there are two phases of building in evidence. The first phase appears to be mainly of wooden structures, and the second phase appears to be mainly of stone structures replacing the earlier buildings. The fort is 375 feet square, and covers and area of around 2 and three quarter acres. The walls around the fort were around 5 feet thick providing excellent protection against attack. The ditch that surrounded the fort, and the wall, amounted to a defensive barrier of around 20 feet. The fort over looks the Roman road that runs over the pass, connecting Ravenglass and Ambleside, to Brougham at Penrith. Much of the structure has been rebuilt from the available rubble at the site, so that the walls that surround the fort on all four sides, stand to around three feet high. The barracks, the bath house and the granaries have all been similarly reconstructed and are therefore very well defined. About 100 yards to the north west of the fort, lays an artificially flattened escarpment which is widely believed to be the camp’s parade ground. The fort at Ambleside is somewhat smaller than the Hardknott fort, and covers an area of around 1 and three quarter acres. The fort measures 300 by 250 feet. The fort is built at the north end of Windermere and was constructed at the end of the first century as the Romans were making headway in the North. The original site was mainly constructed of wood, but was strengthened in the second century with stone structures, and the whole site was lifted on a building platform that would originally have been around four feet high. The fort would have housed around 500 soldiers. There are not so many remains as at Hardknott, but what there is has been restructured again using available rubble. The granaries, some of the outer defences, the main gate, the South gate and the barracks can all be seen clearly. Both of these forts are freely accessible, and worth a visit.